Summer has officially landed! How glorious is this sunshine and weather we're having right now?! Having no choice but to spend the majority of my time in the office, I'm so glad that the blue sky and sunshine drags out to the evening. 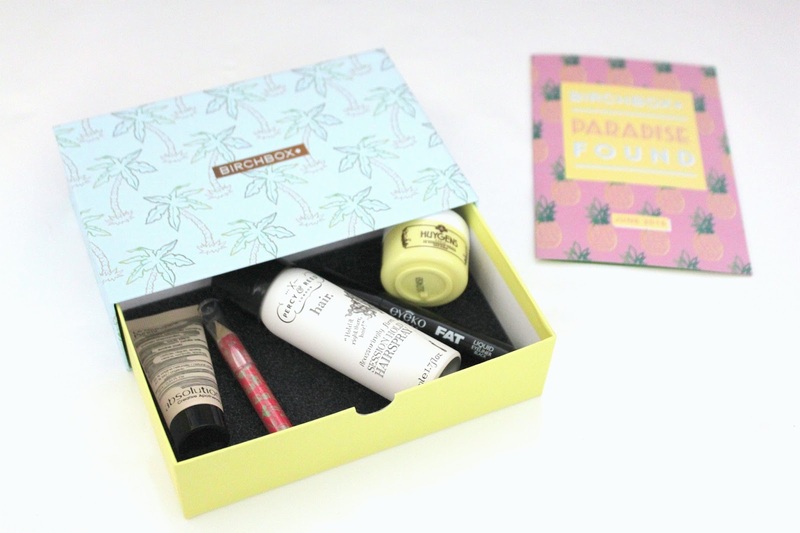 Before heading out to a BBQ the other day after work, I was pleasantly greeted by my 'Paradise Found' June Birchbox. 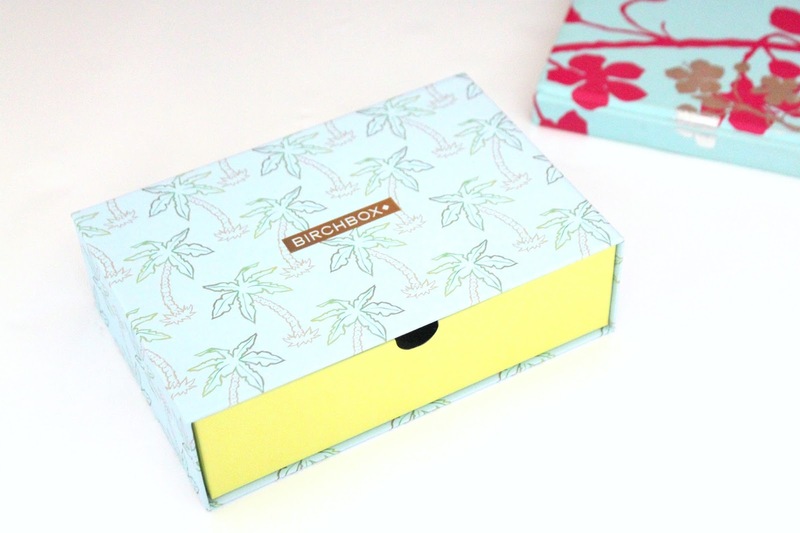 Featuring a print full of palm trees, this month's Birchbox design is ever so tropical and has got me excited for my holiday to Barcelona and Salou this Saturday. I was quite confused as to what this product was when I saw it. It wasn't long after until I realised that this was a cleanser. I haven't tried it yet but I have read good reviews on it. With natural ingredients like camomile and oats, this cleanser is said to be gentle on the skin whilst having the power to remove dirt and grime. I'm definitely going to take this with me on holiday to try out! I was pleasantly pleased to see this scrub in my box. I've always used St. Ives as my facial exfoliator and ever since I've ran out, I've been wanting to try out other exfoliators out there. Being East Asian, we were raised to know the beauty and health benefits that rice has. Now that I've received a sample sized exfoliator by Huygens that is packed with rice powder particles, I'm hoping that this will become a new favourite of mine. Being an eyeliner lover, I haven't tried a brightener eyeliner before. I think I had once when I was 15, where I put too much on so it looked like I was crying. Since then, I have no recollection of using it. This product does look and sound good though. I love the fact how you can use it to highlight under the arch of your brows. I can't wait to give this a go! I hardly ever use hairspray. When I was a dancer, hairspray was something that was always in my handbag because I used it a lot during that time. I hardly ever do anything to my hair other than curl it now, so hairspray isn't really a necessity. I do plan to use this when I attend events/occasions when I have bigger hair, so this product won't exactly go untouched. I've eyed up this eyeliner from Eyeko for a good couple of months now, so I was ecstatically happy to see this in my June Birchbox. It's even more perfect with it being a chubby liner because I always draw on a thick line. Apparently budge-proof, I hope that this eyeliner will stay true to its words, as I'm planning to take it to Barcelona with me. I am happy with all the products that came in my June Birchbox, apart from the Percy & Reed hairspray because I know I won't use it much. The Eyeko eyeliner and Huygens face scrub are probably my most favourite products in my box, so I can't wait to try them out alongside the other goodies I'd received. What do you think about the products I've received? 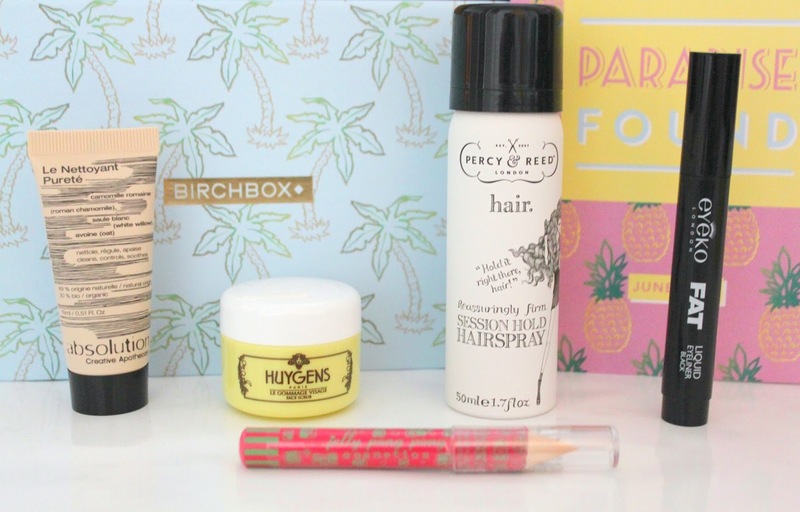 If you're already a subscriber to Birchbox, what did you get in your box? Let me know.